Pickles are great! I’ve always wanted to make my own pickles. 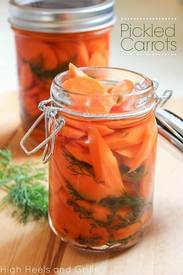 I saw this recipe for pickled carrots in food network magazine, May edition, and I couldn’t resist. It happens to be pretty great. I’ve adjusted the ingredients to my liking a bit. And, I’m perfect, as my family will gladly tell you *cough*, so my take MUST be better.